TMap NEXT Testing Clouds is different from its TMap predecessors. Whereas the books in the TMap series are handbooks with step-by-step information, this book is an innovation, about testing clouds for the early adopter. 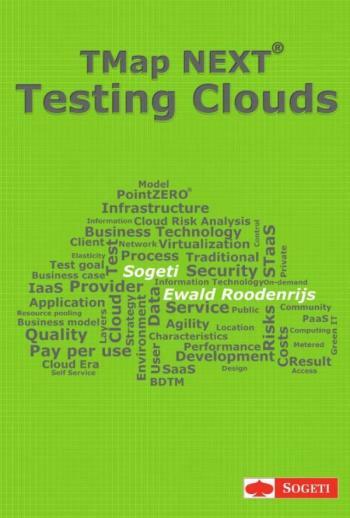 It describes the cloud business model for testing, Business Technology and steps we took in cloud projects. The Cloud is still at an early stage, but the growth of cloud-based computing is outstripping even the most optimistic predictions. Its early 2011 and almost all forecasts of the most important IT technologies name cloud computing in their Top 3. That growth is based on a compelling value proposition: speed to market, agility to bring forward or retire service, and the chance to move expenditure from CapEx into OpEx. Although the cloud is still in its infancy, it is increasingly clear that the cloud model will supplement, if not entirely replace, mainframe and client/server installations in the years to come. The cloud is a business model or platform on which testing must be carried out just like any other service. It enables convenient, on- demand network access to a shared pool of configurable computing resources. It is not only an IT opportunity, but a strategic business opportunity; it creates the ability to get the business in charge of IT and change from Information Technology (IT) to Business Technology (BT). And as the Cloud Era emerges, testing will change! Not only for information systems, but also for testing the infrastructure, cloud- enabled applications, and the ability to have instant deployable test infrastructure. Testing applications on the cloud is the same as testing applications on a traditional infrastructure. Only what is tested is different.